A new survey from the London Recycles campaign shows that an overwhelming majority (86%) of Londoners are committed to reducing their plastic waste. Following increased public awareness on the environmental impacts of plastic, prompted in part by the BBC’s Blue Planet documentary, a new survey from the London Recycles campaign shows that an overwhelming majority (86%) of Londoners are committed to reducing their plastic waste. However, the same research reveals a lack of understanding about what plastic items can be recycled at home, meaning the capital’s residents are missing out on simple ways to make a huge difference. To help Londoners recycle more plastic, London Recycles has launched a new digital campaign called #knowyourplastic. It features short, quirky videos on social media supported by detailed information on www.recycleforlondon.com/know-your-plastic, to let people know how to recycle a wide range of common plastic items at home. 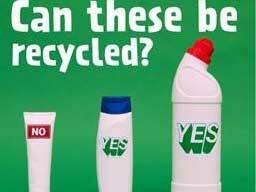 The campaign is being shared by Hounslow Council who want to help residents to understand what can and cannot be accepted for recycling. In Hounslow, over 2,000 tonnes of plastic was sent for recycling last year. However, the borough has ongoing issues with contamination of waste put in the blue box for recycling. Waste such as film, crisp packets, toys, coat hangers as well as bags, pet food pouches and bits of hard plastic broken off furniture, cars etc cannot be recycled and if they are found in residents’ kerbside boxes, the entire box is left, which can frustrate people. One of the worst issues is plastic film. If not detected it tends to get stretched over conveyor belt drums and motors, causing equipment failures and increased downtime for maintenance, cleaning and repair, wasting time and money for no benefit. The borough separates and sorts plastics at its state-of-the-art Materials Handling Facility on Southall Lane. Any non-recyclable items have to be pulled out and sent away as general refuse. However, no manual picking is perfect and if recycling materials are sent with contaminants, the reprocessor will lower the price paid to us and have to dispose of it, causing more wasted time and effort. It would be far easier if we could avoid the issues to begin with and this is where the #knowyourplastic comes in. Please take time to review what can and cannot be recycled in your kerbside collection. “We welcome this initiative in Hounslow as many of our residents are committed to doing the right thing, but there is confusion at times about which plastics can and cannot be recycled. Anything that clarifies this and reduces the level of plastics that end up polluting the environment or contaminating our recycling process is fantastic news for the borough and we are giving this campaign our wholehearted support.